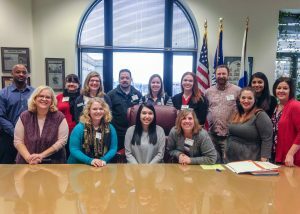 We started out our day of downtown delights at the Kenosha County Administration Building, where the Kenosha County Board holds their monthly meetings, and you can find the office of the Kenosha County Executive, Jim Kreuser. If you’ve never been to this building, you should visit. Its history and stately architecture is surely something to behold – especially the impressive county board chambers, which felt something like a courtroom and church at the same time. Our day, focused on trust in leadership, began here. Fellow LK participants, Michelle Carothers and Theresa Swisher, presented on our book chapter, ‘Trust Rules’. The highlights of this lesson hit upon how fostering trust is essential to the success of a leader. Some key behaviors to nurture trust included behaving predictably and consistently, communicating clearly, treating promises seriously, and being forthright and candid. Michelle and Theresa wrapped up their presentation with a trust exercise. Participants were asked to pair up and look into each other’s eyes for one minute without looking away. The first round wasn’t too difficult, as we tended to pair up with those with which we were most comfortable and talked throughout the minute. For the second round, we were asked to switch to a new partner and look into their eyes without talking for one whole minute. This round was definitely harder. Luckily, I felt that our LK group had already done much team and trust building, so the exercise was definitely not as painful as it might have been with a different team. Next, we were given a tour and history of the building by Joe Potente, the Kenosha County Communications Manager. Following the tour was an opportunity to speak to a panel of local government representatives: Kim Breunig, Kenosha County Board Chairwoman, Jack Rose, Kenosha Common Council Alderman, George Stoner, Village of Somers President, and Mark Molinaro, Town of Somers Chair. The panel explained to us the different municipalities in the county, their personal journeys, including what led them to local government, and some current issues in the county about which they are concerned. This panel was very enlightening, as I have never learned much about local government. I had no idea that most of our local representatives are not career politicians but individuals who have other occupations – who still volunteer large amounts of time in order to represent their communities, taking responsibility for the decisions that shape their community. I was very inspired by their contributions. Following the panel, we were visited by local chapters of Toastmasters, led by Ron Morishita, who gave a presentation on public speaking tips. After the presentation, we were all asked to give a brief ‘elevator speech’ on the topic ‘What does your job entail’. Each LK participant gave a successful speech, with AJ Chivell and Renee Young-Trego using the least filler words! Our afternoon was spent at the Kenosha News, where we learned about Ethical Leadership from Lou Molitor, the President/CEO of Kenosha Area Chamber of Commerce. Though we are all familiar with the notion of ‘Ethics’ in the work environment, it was very interesting to parse the idea into definitions, theories, and decision-making models. To wrap up the lesson, LK participants broke up into groups to take a case study and work through the problem applying an ethical decision-making model. This was an enlightening way to see how the different models function and why they are useful. After the ethical leadership session, Randy Rickman, the publisher of the Kenosha News, talked to our group about the role of the media in a local community. 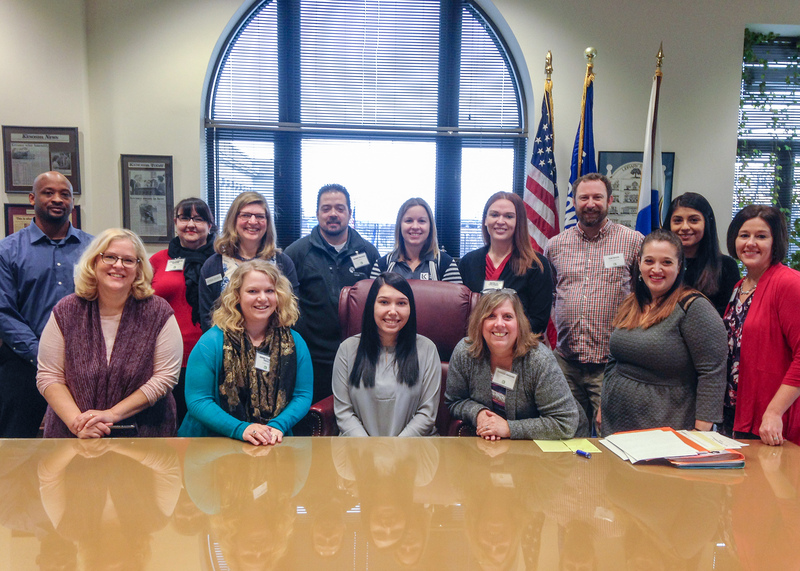 He updated us on how the Kenosha News is changing to remain relevant to our local community, as well as touched on what he does to foster trust among the employees at the Kenosha News. To wrap up the day, LK participants broke into team project groups to make progress on their work. Today’s take away is that trust is an essential part of an individual’s success, whether this be in their individual work as part of a unit, leading a team, or taking on greater responsibility and speaking for a community.